Now is Kerry’s moment to convince Netanyahu and Abbas that he is determined to end the permanent conflict between them. (CHICAGO) - John Kerry is back in Washington after his fifth official trip to the Middle East. He is already planning his return to the region. Despite the lack of any visible signs of success, the U.S. Secretary of State remains determined to resolve what is generally seen in official Washington as an intractable conflict between Israel and Palestine. This is not Kerry’s first political rodeo. There is nothing quite like rising from his role as an anti-war Vietnam veteran to become a U.S. senator, a U.S. presidential candidate and chairman of the senate foreign relations committee, to teach someone the art of politics. John Kerry’s first appearance on the American political scene was as a young Navy lieutenant appearing before the same Senate Foreign Relations Committee which he would one day chair. (1971 picture of Kerry testifying above). On April 22,1971, a young Lieutenant named John Kerry came before the Senate Foreign Relations Committee, being the first Vietnam veteran to testify before Congress on the subject of ending the war in which he served. He appeared on behalf of the Vietnam Veterans Against the War (VVAW), a group of over 20,000 former military servicemen who collectively called for an end to the military operations and atrocities in Vietnam. Lt. Kerry gave a prepared speech, eloquent and precise, poignant and riveting. He spoke of the crimes of the American soldiers committed in Vietnam, the mystic veil of communism which had justified such killing and destruction, the lies of the American executive which directed these immoral actions, and the convergence of all said injustice to yield the most grave mistake which had just then become realized to the majority of the American public. After serving his country as a young naval officer in Vietnam, Kerry has been in politics most of his adult life, starting as lieutenant governor of Massachusetts in 1983, and then as a U.S. senator from the same state from 1985 until he was asked by President Obama to succeed Hillary Clinton as Secretary of State. Kerry comes to this moment in history out of a rich history of service to his country. The dogged pursuit of an agreement by a man who has seen war suggests that it is a real possibility that John Kerry knows something about the Netanyahu-Abbas talks that the rest of us do not know. In his dogged pursuit for an agreement, he is undertaking another “last mission” to prevent a permanent Middle East war. Whether there is any substantive narrowing of differences between the two sides is unknown. Mr. Kerry’s determination to maintain secrecy is frustrating to anyone following his mission but also tactical, since unveiling details prematurely is more likely to back Israelis and Palestinians into opposite corners. It could be that Kerry is not just negotiating. It is quite possible that he is pressing Israel to take more than just token steps toward showing the Palestinian leaders that Israel is ready to ease its prison-like grip on a people whose land they illegally occupy. Nelson Mandela, near death in a South African hospital, leaves behind a text which could serve as a guide for Kerry, a text related, perhaps, to Mandela’s painful experience as a political prisoner in South Africa. 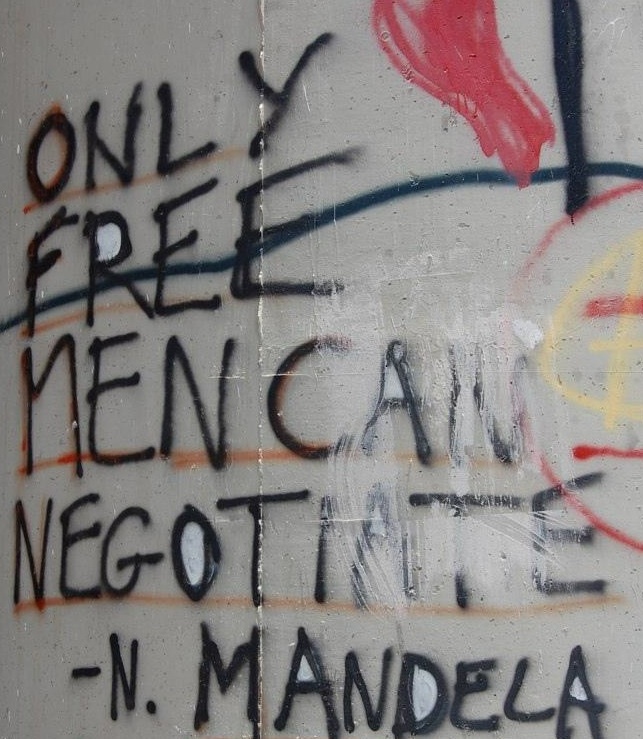 The Mandela text is well known in Palestine, enough so that it appears on posters and in one instance, is scrawled in paint on Israel’s illegal wall of separation. As a young man in 1971, John Kerry testified against an absurd war in Vietnam. Now is Kerry’s moment to convince Netanyahu and Abbas that he is determined to end the permanent conflict between them. He is prepared to end that conflict and then walk with them over the rocky road that would follow a successful end to negotiations. It would then be up to President Obama to stand with his Secretary of State in what would be a difficult period ahead. Obama and Kerry will not have the backing of the U.S. Congress in this struggle, but what care Obama and Kerry about a Zionist-Tea Party controlled Congress when the executive branch of government offers Netanyahu and Abbas a way out of their permanent state of conflict. Is something like this in Kerry’s thinking as he flies back and forth between Washington and Tel Aviv? Or is it wistful thinking about the impossible? We wish that a merciful God could wipe away our own memories of that service as easily as this administration has wiped their memories of us. But all that they have done and all that they can do by this denial is to make more clear than ever our own determination to undertake one last mission, to search out and destroy the last vestige of this barbarous war, to pacify our own hearts, to conquer the hate and the fear that have driven this country these last 10 years and more and so when, in 30 years from now, our brothers go down the street without a leg, without an arm or a face, and small boys ask why, we will be able to say “Vietnam” and not mean a desert, not a filthy obscene memory but mean instead the place where America finally turned and where soldiers like us helped it in the turning. Thank you. The photo of John Kerry is from a CSPAN screen shot in 1971. It appeared in Liberty in Exile. The picture of the Mandela quote is from Flicka on Photostream. Journalism was Jim Wall’s undergraduate college major at Emory University, Atlanta, Georgia. He has earned two MA degrees, one from Emory, and one from the University of Chicago, both in religion. An ordained United Methodist clergy person; he and his wife, Mary Eleanor, are the parents of three sons, and the grandparents of four grandchildren. They live in Elmhurst, Illinois.